hi john, I reinstalled latest chipset drivers on a windows clean install but somehow the app won't detect the installation even if it gets installed with no errors. Wow.... that app was discontinued ages ago!!! We now use 4 different apps, that you can learn about in my signature. Your license for that old app will work with Updater btw. Thanks John for your quick answer. I'll attempt your solution next week. I've always installed the realtek driver first, SBX later, so I'll give it a try. Would you advise to force install the chipset drivers? The Fix don´t work for me. Everythng runs fine, only the brightness change wont work. not only with the FN buttons, also in windows setting it wont work. Basically in "MSHybrid" you can´t control Brightness correct? And in "Discrete Mode" you can, correct. To get Brightness to work in MSHybrid you just need to have the Intel Graphics installed and the Fix in Control Station, that´s it. Tested with pretty much all units. oh.. i had no idea :/, how can I use my old license with this updater? can i buy from your website a conversion to a new one? what do i do with this new section of the program? also i see you don't support clevo control center anymore? am i meant to update it in anyway now? Remote monitor allows you to fetch data from your Fan Control software over LAN/INTERNET. 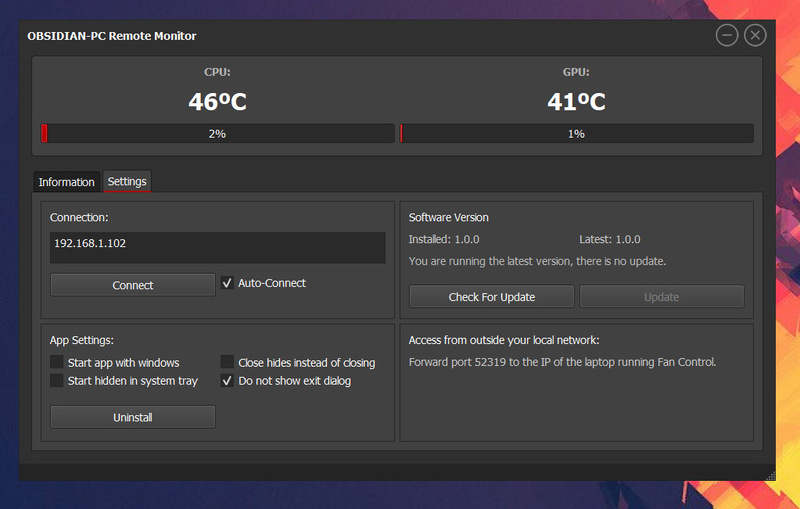 With this app you can monitor the temperatures and fans in another computer. Monitoring the P775 (on the right) using the N151 with Remote Monitor(on the left). To connect over the internet just setup your router to forward port 52319 to the IP of the laptop running Fan Control (the one we will be monitoring). Hi! I have installed the Updater a coupe of months ago, and now decided that I want to get rid of all CCC-things on my computer and replace it with your suite (control station, LED and Fan control). My question is, what do I need to do to remove CCC completely? Do I just uninstall it, using CCleaner or whatever? Or do I need to manualy remove anything else? Thanks for your hard work! Learned a lot just by following this thread.